If you’re one of those weirdos that doesn’t like the magical flavor of the coconut, then this recipe is most definitely not for you. These tasty breakfast delights contain just about as much coconut as you could possibly fit into a pancake. The idea came to me one morning when I was in the mood for a change of pace. We make keto protein pancakes about once a week, and I needed to change it up. So I started experimenting. What happens if I just take every coconut related item I have in the kitchen and jam it into a pancake? Well, the answer is it doesn’t make a pancake, it makes a ball of coconut matter that you can’t really do anything with. Fortunately I’m not the type to give up after just 1 failed attempt! 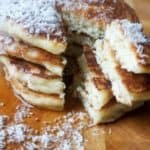 I made a few tweaks, begrudgingly added in a couple items not made exclusively out of coconut, and finally achieved the most coconuty, most tasty, most fluffy Low Carb Coconut Pancakes! This pancake batter will likely be different than what your used to. No milk, no butter. Why use milk and butter when we can use their coconut derived counterparts? Coconut milk(full fat) and coconut oil! Oh, and in place of the all-purpose flour? You guessed it… coconut flour! Now all of these substitutions are critical for jamming the absolute maximum amount of coconut flavor into these low carb coconut pancakes. The resulting batter will be thicker than a standard pancake batter. This batter does not pour easily into the pan. You will have to spoon it out and spread it around in the pan to flatten it out. Don’t worry though! It cooks up nice and fluffy. As a matter of fact, these pancakes are among the fluffiest low carb pancakes we’ve made to date! Like a traditional pancake, feel free to top these low carb coconut pancakes off with your classic butter and syrup(we use sugar free) combo. If your like me though, you’re going to want to add more coconut on top. A simple way to do that is to dust these beautiful cakes with some more shredded coconut. If you want to get wild and crazy you can try making some coconut whipped cream! Our coconut whipped cream recipe is still a work in progress, but we’ll be posted it as soon as it’s perfected, so check back in a few months. 1/2 Cup Coconut Milk We use this! 20 Drops Liquid Stevia Optional (20 drops makes these lightly sweet) - We use this! 1/2 Cup Coconut flour We use this! 1/2 Cup unsweetened shredded coconut We use this! 2 tsp Baking powder We use this! 1/4 Cup Whey Protein We use this! 1/4 Cup coconut oil We use this! 1 tsp vanilla extract We use this! Using a food processor or a mixer combine all of the wet ingredients and thoroughly mix. This includes cream, eggs, coconut milk, stevia, vanilla, and coconut oil(melted). Combine all of the dry ingredients separately and mix together. Slowly and gently mix the dry ingredients into the wet mixture being careful not to over mix. You want a homogeneous mixture but some lumps is fine. Heat a nonstick skillet over low-medium heat. This batter is thick so have the burner lower than you would for normal pancakes. Spoon the mixture into the pan and form into pancakes with a spatula. You will need to form these manually as the batter is thick to the point that it won't spread out by itself in the pan. This is a good thing! Cook for 5 minutes on each side, or until you notice bubbles on the top side of the pancake. That is a telltale sign that it is ready to be flipped. Top with butter, syrup and additional coconut flakes and enjoy!